Cultivating crops in a changing climate. 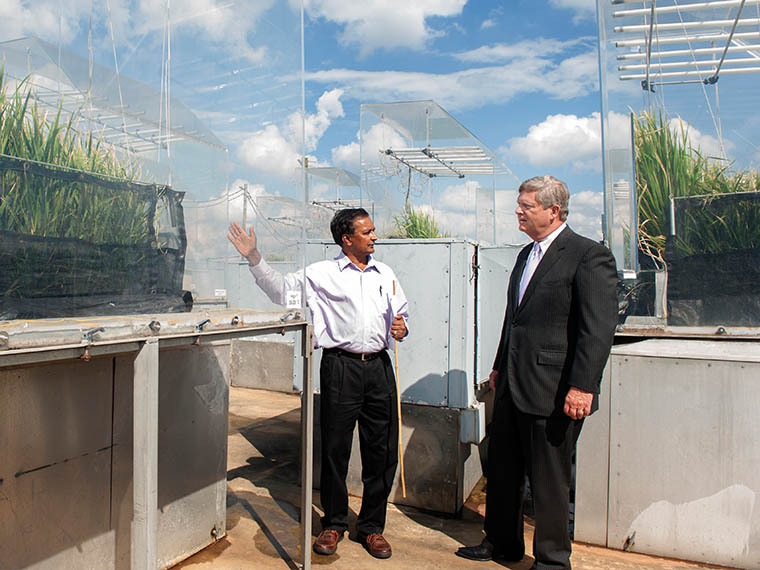 K. Raja Reddy and Tom Vilsack, U.S. Secretary of Agriculture, tour the Soil-Plant-Atmosphere-Research unit at the R.R. Foil Plant Research Center. Photo by Beth Wynn. The anticipated climate change will increasingly impact crop production and food security in the coming years. Reddy researches how environmental stressors impact crops. The research helps equip both seed breeders and farmers with the tools they need in a changing climate. Reddy is the director of the Soil-Plant- Atmosphere-Research, or SPAR, facility at MSU. Researchers at the facility assess how global climate change impacts the biology of crops. 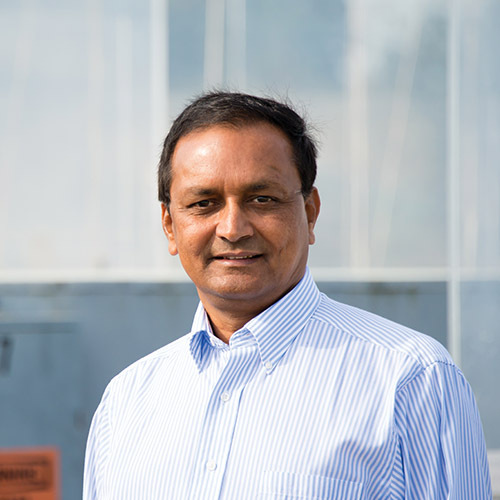 Reddy and his team focus on environmental plant physiology, evaluating such factors as temperature, drought, solar radiation including ultraviolet-B radiation and nutrients. As a physiologist, Reddy works across crops evaluating row-crops such as corn, rice, soybeans and cotton, along with crops like sweet potatoes, peppers and cowpeas also known as black-eyed peas. He even studies biofuel crops. 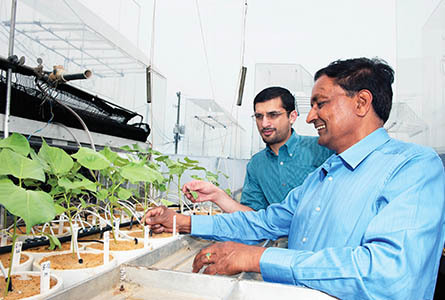 Mississippi State University professor K. Raja Reddy, foreground, shows Omar Ali, a doctoral student from Iraq, cotton plants growing in the SPAR unit. Photo by Beth Wynn. For instance, in 2011 and 2012, the Mid-south had high temperatures in the rice-growing regions so the rice promotion board asked the SPAR group to screen rice cultivars for high temperature tolerance. The SPAR facility is very unique, said Reddy. It was built locally in the 1970s as the first facility of its kind. Currently, there is only one other facility like it in the world. SPAR is a controlled environment research facility, which includes ten outdoor naturally-lit chambers, with computer control of environmental factors. Researchers apply remote sensing technology to assess crop stress physiology and stress-related aspects. They are also working on crop modeling and its applications, in collaboration with the USDA-ARS. They have developed a cotton simulation model called GOSSYM. The model is used by USDA-ARS for climate impact analysis for cotton. It is the first of its kind being used in real world situations with recent technology. As far as we know, this is the only state-of-art facility with an in-house program that has the capability to monitor so many plant responses. We monitor 610 various environmental and plant process signals every ten seconds with the system. Plants in SPAR experiments grow as they would in the outside environment so researchers can easily translate the research directly to the field. Additionally, recent advances in equipment and remote field monitoring technologies will help facilitate more direct intervention with management practices to optimize the production during crop growth. The team determines functional mathematical algorithms by introducing a wide range of stressors and studying how the plant will respond within that range of environmental factors to develop predicted results with various management practices. The team’s research on the impact of environmental stressors on corn was recently published in Crop Science, a publication of the Crop Science Society of America and featured in their monthly news magazine. In one study, researchers evaluated corn’s tolerance of current and future UV-B radiation, which is incrementally increasing on a global scale, and how it impacts corn growth. In another corn study, researchers evaluated cold tolerance in corn hybrids. This research will help producers select hybrids to maximize corn production in early planting production systems, which is a management method adopted to avoid plants being exposed to hotter, more drought-prone conditions during critical growth stages. Reddy is also assessing how temperature and drought impact the quality and quantity of cotton fibers. These studies and other research have been covered in many outlets including Seed World and Advances in Agronomy, premier journals in this area. According to Reddy, the U.S. is reaching maximum potential in very high production environments with existing genetic material and as food production becomes increasingly critical on the global scale. Efficiency in these environments is vital. Passion At Work: I strive to understand how plants respond to the environment so that suitable tools can be developed for management and impact assessment.